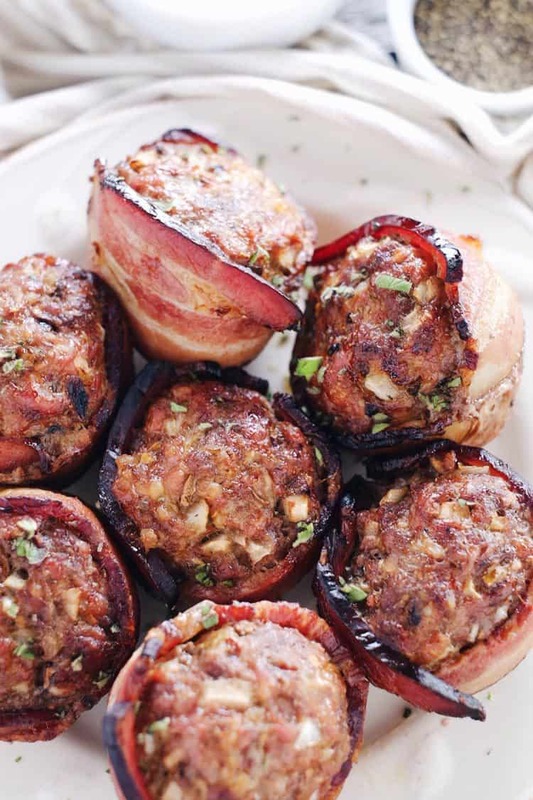 Ok, this mini bacon wrapped meatloaf recipe is a winner for so many reasons! Not only are things just better in mini sizes, but these mini meatloaves are great for an egg-free breakfast, a hearty lunch, or dinner! I mean I could almost put some ice cream on top, and eat them for dessert too! Ok, I’m kidding on the dessert part, but they are seriously the perfect make-ahead recipe, so you have something delicious on hand for a quick breakfast, an easy pack and go lunch, or dinner after a busy day! Bacon, ground beef, and Italian sausage make this recipe so dang tasty. A clean Italian sausage can be a tougher item to find though, and we’ve done our best to find a clean and readily available one. We use Isernio’s spicy Italian sausage, which we purchase regularly at Trader Joe’s. You can use their store locator to find a location that sells it near you. The addition of Italian sausage to this meatloaf gives it lots of extra flavor. We occasionally make our own sausage using ground pork from pigs Justin’s mom raises. We also get bacon from her, but when we are low on our stock we purchase Hempler’s natural uncured bacon from Costco. The pigs for the Hempler’s bacon are fed a vegan diet, which does unfortunately include grains, but everything else is very clean! It is the best store-bought bacon we have been able to find. Another great feature of this mini bacon wrapped meatloaf recipe is that it only takes about 10 minutes to prep and get it in the oven. It will bake for about 30 minutes, and for your efforts you will have a delicious meal on the table, or you can store it in the fridge or freezer to have on hand for a quick and filling breakfast, lunch on the go, or a hearty dinner. Whenever you eat it, just add some greens and enjoy! Make our mini bacon wrapped meatloaf, and enjoy it for breakfast, lunch, or dinner. Let us know how it goes by leaving a comment below. Then, take a photo and tag us on Instagram @realsimplegood, so we can check it out! 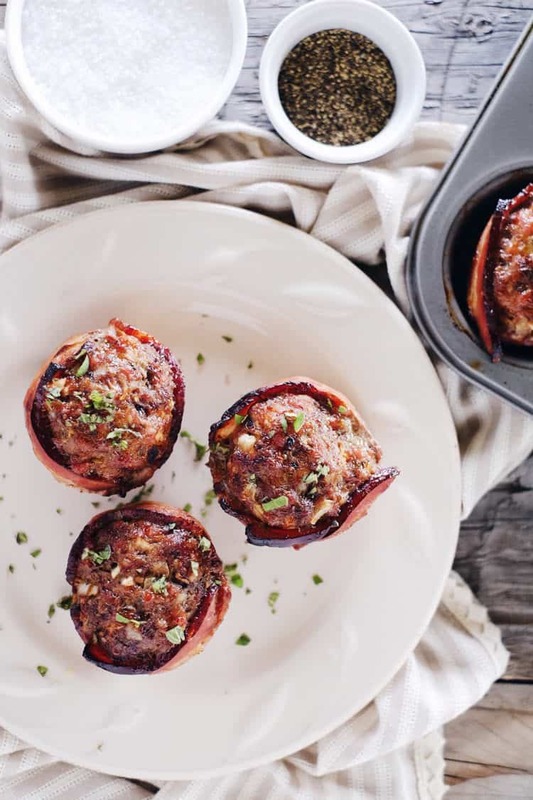 This mini bacon wrapped meatloaf recipe is a winner for many reasons! Paleo + Whole30, they are great for breakfast, lunch, or dinner! Did I mention bacon? Preheat oven to 400 degrees fahrenheit. If you want to save yourself some clean up, line the bottom of the oven with a sheet of aluminum foil. The bacon and meatloaf tends to bubble and drip when cooking. Next, cut up garlic, onion, mushrooms, and oregano. Place in a large mixing bowl and add in beef, sausage, and pepper. Use hands to mix ingredients together well. Divide into 8-10 equal sized portions and shape into small round balls slightly smaller than the size of your muffin tin. 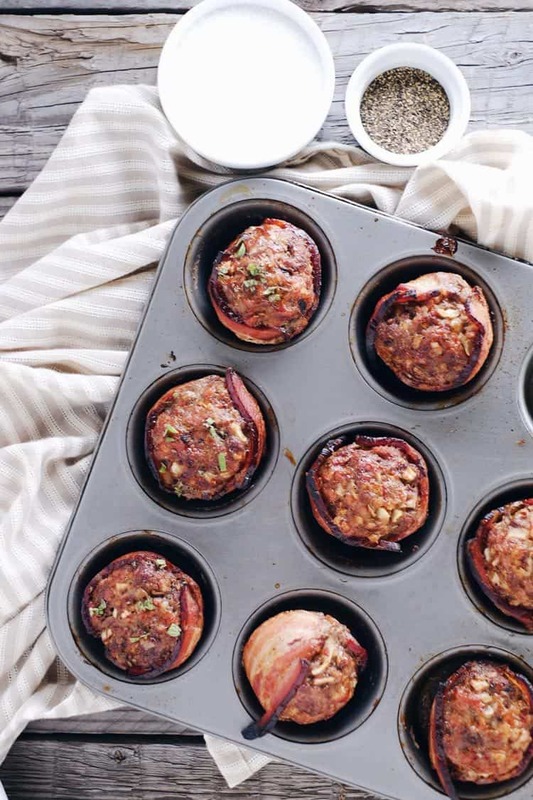 Wrap bacon slices around the edge of each meatloaf ball and place in the muffin tin. The bacon ends should just meet or slightly overlap, so cut bacon pieces as necessary to fit. Bake for 30 minutes. Remove from oven and allow to cool for at least 5 minutes before serving. 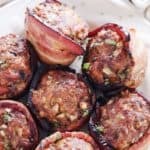 I love this idea for individual meatloaves, and of course the bacon doesn’t hurt either! I can’t wait to try these out, they’ll be perfect to take along in lunches too! Thanks Kari! Totally agreed that the bacon is a nice bonus, and they are perfect for lunches on the go, too! Hope you enjoy! Thanks for visiting! These look fantastic. Love how you combined sausage meat and beef. You sealed the deal with bacon! YUMMO! Flavor was great, bacon not done enough for me — think I’ll try again but precook the bacon in the tins, and add meatloaf a bit later… thanks for the idea! Would these be good to cook and then freeze? Or would I be better off making a bacon wrapped meatloaf? Our family went NUTS over these! My son has named them “meatloaf bombs”. I have been asked to add them to the normal meal rotation and my son even asked to take a “bomb” to school with him in his thermos. Thank you! Hi there! We actually do not track nutrition info for any of our recipes. We’ve found that just focusing on eating real food and not counting anything works well for us and our lifestyle. Sorry we don’t have the info for you. As for serving size…we usually just eat them solo or with some greens. I usually eat 1-2, and Justin will typically eat 2-3. I have a question! I’m really wanting to make these, but can’t get my hands on any good italian sausage at the grocery stores in my area. Would you recommend mixing the ground beef with ground turkey, or maybe doing 1lb of ground beef instead a 1/2 pound? You could do either. All beef or a mix of beef with turkey or pork would work. You might want to add in a little extra seasoning to the mix though, as the Italian sausage does add a lot of flavor. I’d suggest a tsp or 2 of Italian seasoning and a 1/2 tsp of salt. Or whatever your favorite seasonings are that sound good. Please let us know how it turns out!